On the Leading with Health podcast, healthcare leaders join host Jennifer Michelle to discuss growth, change and their vision for the future of healthcare. Jennifer Michelle, MPH, EMT is a marketing consultant specializing in the healthcare sector. President of Michelle Marketing Strategies, she has a Master's in International Health & Epidemiology and currently volunteers as an EMT. Her unique background allows her to bring unexpected insight and depth to every interview. *Formerly titled "Healthcare Lead Generation"
Advance Directives are a conversation frequently dreaded by both patients and providers. Yet avoiding them can result in even more painful situations down the line. That is why Karen Kopan has launched Intensive Karen to help educate people on the importance of Advance Directives. Karen Kopan is a critical care nurse practitioner with over 30 years of Intensive Care nursing experience. Throughout her career, she has worked alongside patients, their families, friends and hospital staff. Her mission is to educate others about Advance Directives. She is committed to changing the way we talk about life and death, in the hospital and in our everyday lives. In the podcast, we discuss: - Patient-centered care - Advocating for yourself within the health system - Advance Directives This is an episode of the Leading with Health podcast, formerly titled “Healthcare Lead Generation.” In this podcast, healthcare leaders join host Jennifer Michelle to discuss growth, change and their vision for the future of healthcare. Jennifer Michelle, MPH, EMT is a marketing consultant specializing in the healthcare sector. President of Michelle Marketing Strategies, she has a Master’s in International Health & Epidemiology and volunteers as an EMT. Her unique background allows her to bring unexpected insight and depth to every interview. Find out how our view of healthcare data is changing - and why we need to put the patient first in all data and IT initiatives. See how the transition to value-based care is impacting the world of healthcare data. Laura Adams is the Founding President and CEO of the Rhode Island Quality Institute - riqi.org - which is a center of collaborative innovation in healthcare. Health Data Management named her to their 2018 Most Powerful Women in Health IT in the Thought Leader category. In addition, she is currently co-chairing the National Academy of Medicine’s Health Data Trust Initiative Steering Committee and serves on the Oversight Council for the Massachusetts Center for Healthcare Information and Analysis. Presented by lead generation marketing expert Jennifer Michelle. For more information, visit MichelleMarketingStrategies.com - and follow the #HCLeadGen hashtag for new interviews and tips! Find out what companies like JetBlue, Starbucks, Uber and Walmart can teach the senior care industry - and learn what innovations are coming down the pike. Maggie Keen is the VP of Strategic Initiatives at myCNAjobs.com. She is a national caregiver recruitment speaker and, after spending the last 4 years consulting with top senior care companies across the country, she has unique insight into what innovators are doing to tackle their toughest recruiting challenges. She’s on a mission to arm healthcare recruiters with more insight about caregiver motivations to fuel the hiring and retention of a workforce plagued with high turnover. Presented by lead generation marketing expert Jennifer Michelle. For more information, visit MichelleMarketingStrategies.com - and follow the #HCLeadGen hashtag for new interviews and tips! Linda Leekley is the Founder and CEO of In the Know Caregiver Training - knowingmore.com. By launching her company, Linda successfully filled a void in training options for direct care workers. She blended her nursing experience with her years as a clinical educator to make In the Know the leader in professionally prepared caregiver training. Find out why we have a caregiver shortage and how we can change the paradigm surrounding caregiving as a profession. Discover how co-ops are successfully decreasing caregiver turnover - and what people need in order to stay with the profession long-term. Presented by lead generation marketing expert Jennifer Michelle. For more information, visit MichelleMarketingStrategies.com - and follow the #HCLeadGen hashtag for new interviews and tips! Dr. Sophia Yen is the CEO and Co-Founder of Pandia Health - pandiahealth.com - which brings birth control to any woman with a mailbox and an internet connection. Find out why Dr. Yen launched her platform and how they are using it to improve healthcare for Gen Z and millennial women. Presented by lead generation marketing expert Jennifer Michelle. For more information, visit MichelleMarketingStrategies.com - and follow the #HCLeadGen hashtag for new interviews and tips! Discover how to handle negative patient reviews - while still creating an online reputation that reflects your skill and dedication. Elle Pierson joins me for a 3-part interview on reputation management for medical providers in private practice. Elle Pierson is an RN and reputation management consultant. She works with healthcare organizations to build, protect and manage their online reputations. She can be found at digitalhealthcareconsultants.com. Presented by lead generation marketing expert Jennifer Michelle. For more information, visit MichelleMarketingStrategies.com - and follow the #HCLeadGen hashtag for new interviews and tips! Find out how you can use the power of online patient ratings to grow your medical practice and gain happy, devoted patients. Elle Pierson joins me for a 3-part interview on reputation management for medical providers in private practice. Elle Pierson is an RN and reputation management consultant. She works with healthcare organizations to build, protect and manage their online reputations. She can be found at digitalhealthcareconsultants.com. Presented by lead generation marketing expert Jennifer Michelle. For more information, visit MichelleMarketingStrategies.com - and follow the #HCLeadGen hashtag for new interviews and tips! Learn why medical providers in private practice need to understand the world of online ratings and patient reviews. Elle Pierson joins me for a 3-part interview on reputation management for medical providers in private practice. Elle Pierson is an RN and reputation management consultant. She works with healthcare organizations to build, protect and manage their online reputations. She can be found at digitalhealthcareconsultants.com. Presented by lead generation marketing expert Jennifer Michelle. For more information, visit MichelleMarketingStrategies.com - and follow the #HCLeadGen hashtag for new interviews and tips! Sarah M. Worthy is the CEO at Door Space - doorspaceinc.com - a digital talent management system for healthcare. Find out why she launched her company and how good market research has set her apart from the crowd. Presented by lead generation marketing expert Jennifer Michelle. For more information, visit MichelleMarketingStrategies.com - and follow the #HCLeadGen hashtag for new interviews and tips! Beth Meyer-Frank has been providing health care for 25 years as a nurse practitioner in the areas of reproductive health care, addiction and psychiatry. Her work with addicted women led her to launch Planning to Flourish, which promotes awareness of the enormous power family planning has in helping addicted women rebuild their lives. Learn more at planningtoflourish.org. Presented by lead generation marketing expert Jennifer Michelle. For more information, visit MichelleMarketingStrategies.com - and follow the #HCLeadGen hashtag for new interviews and tips! Learn how Dr. Pavini came to create a simple device that improves mobility in ICU patients and addresses key factors that contribute to PICS. In this podcast, I interview Dr. Marie Pavini. Dr. Pavini is a critical care physician and the founder of Healthy Design, whose flagship product is Exersides™, a restraint alternative for sedated or confused patients with vital lines and tubes to protect. Find out more at Exersides.com Presented by lead generation marketing expert Jennifer Michelle. For more information, visit MichelleMarketingStrategies.com - and follow the #HCLeadGen hashtag for new interviews and tips! In this interview, I speak with Elizabeth Lamont, MD of Salient Care. An oncologist and scientist, she develops healthcare apps and other patient-focused technology. Find out how the new emphasis on patient satisfaction is making it easier to get buy-in on patient-centered apps and technology. See also: https://www.salientcarellc.com/ This podcast brings healthcare IT disruptors, innovative healthcare providers and health sector company leaders in to discuss growth strategies and navigating change with lead generation marketing expert Jennifer Michelle. For more information, visit MichelleMarketingStrategies.com - and follow the #HCLeadGen hashtag for new interviews and tips! In this Quick Tip, I show how customer support influences lead generation and where healthcare IT companies need to watch out. 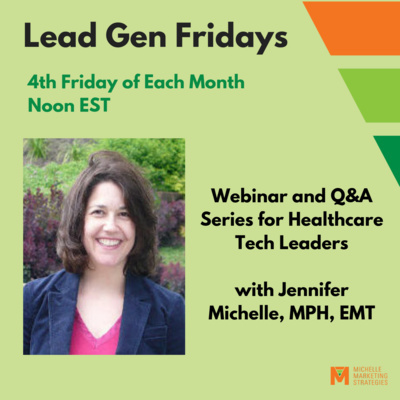 This podcast brings healthcare IT disruptors, innovative healthcare providers and health sector company leaders in to discuss growth strategies and navigating change with lead generation marketing expert Jennifer Michelle. For more information, visit MichelleMarketingStrategies.com - and follow the #HCLeadGen hashtag for new interviews and tips! Quick Tip #10 Healthcare IT Lead Gen Case Studies In this Quick Tip, I take a peek at common lead gen errors made by two healthcare IT companies. This podcast brings healthcare IT disruptors, innovative healthcare providers and health sector company leaders in to discuss growth strategies and navigating change with lead generation marketing expert Jennifer Michelle. For more information, visit MichelleMarketingStrategies.com - and follow the #HCLeadGen hashtag for new interviews and tips! Discover ways you can help health systems access funding - so they see you as a partner, not a salesperson. Amelia Roberts joins me for a 3-part interview on building relationships with healthcare systems. Amelia Roberts is a registered nurse by trade, entrepreneur by passion and expert silo hacker. She facilitates collaborative relationships (partnerships) that help busy professionals THRIVE mind body and business. She can be found at www.solutionsbyamelia.com. Presented by lead generation marketing expert Jennifer Michelle. For more information, visit www.MichelleMarketingStrategies.com - and follow the #HCLeadGen hashtag for new interviews and tips! Learn which committees are essential to getting your solution into a new health system - and what they are really looking for. Amelia Roberts joins me for a 3-part interview on building relationships with healthcare systems. Amelia Roberts is a registered nurse by trade, entrepreneur by passion and expert silo hacker. She facilitates collaborative relationships (partnerships) that help busy professionals THRIVE mind body and business. She can be found at www.solutionsbyamelia.com. Presented by lead generation marketing expert Jennifer Michelle. For more information, visit MichelleMarketingStrategies.com/. Follow the #HCLeadGen hashtag for new interviews and tips! Discover what vendors get wrong about selling to health systems - and how timing and relationship-building make all the difference. Amelia Roberts joins me for a 3-part interview on building relationships with healthcare systems. Amelia Roberts is a registered nurse by trade, entrepreneur by passion and expert silo hacker. She facilitates collaborative relationships (partnerships) that help busy professionals THRIVE mind body and business. She can be found at www.solutionsbyamelia.com. Presented by lead generation marketing expert Jennifer Michelle. For more information, visit MichelleMarketingStrategies.com - and follow the #HCLeadGen hashtag for new interviews and tips! Discover what resources are out there for healthcare IT companies looking to hire a diverse team - and see how Apple is (again!) ahead of the curve. Jenn Dennard joins me for a 3-part interview on diversity in healthcare IT companies. Jenn is the founder of #HealthITchicks, a grassroots, high-energy networking group of women (and men!) focused on raising awareness of gender-related issues in healthcare technology and the workplace at large. The #healthITchicks community strives – above all – to help its members invest in the personal and professional lives of each other, and of those in need. Presented by lead generation marketing expert Jennifer Michelle. For more information, visit MichelleMarketingStrategies.com/. Follow the #HCLeadGen hashtag for new interviews and tips! See how women in healthcare IT are steering startups in the right direction. Learn what can be done to promote diversity during hiring. 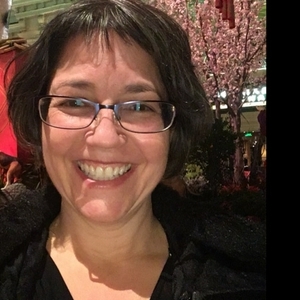 Jenn Dennard joins me for a 3-part interview on diversity in healthcare IT companies. Jenn is the founder of #HealthITchicks, a grassroots, high-energy networking group of women (and men!) focused on raising awareness of gender-related issues in healthcare technology and the workplace at large. The #healthITchicks community strives – above all – to help its members invest in the personal and professional lives of each other, and of those in need. Presented by lead generation marketing expert Jennifer Michelle. For more information, visit MichelleMarketingStrategies.com/. Follow the #HCLeadGen hashtag for new interviews and tips! Find out why diversity hiring is such a hot topic among healthcare IT companies - and why your company must not be left behind! Jenn Dennard joins me for a 3-part interview on diversity in healthcare IT companies. Jenn is the founder of #HealthITchicks, a grassroots, high-energy networking group of women (and men!) focused on raising awareness of gender-related issues in healthcare technology and the workplace at large. The #healthITchicks community strives – above all – to help its members invest in the personal and professional lives of each other, and of those in need. Presented by lead generation marketing expert Jennifer Michelle. For more information, visit MichelleMarketingStrategies.com/. Follow the #HCLeadGen hashtag for new interviews and tips! Find out why a short-term social media strategy will always fail. Learn how even a 1-person marketing team can build a strong network. Angela Hemans joins me for a 3-part interview on using social media to promote businesses in the healthcare space, including healthcare IT companies, as well as healthcare organizations. Angela is CEO of Hemans Marketing Media and founder of Women United In Business Mastermind Facebook Group. She helps healthcare, Tech, and Nonprofits build influence, make an impact, and increase leads leveraging social media and digital technology. Presented by lead generation marketing expert Jennifer Michelle. For more information, visit MichelleMarketingStrategies.com. Follow the #HCLeadGen hashtag for new interviews and tips! Discover why Twitter is so useful for building thought leadership in the healthcare sector. Find out where to connect with journalists online and why the most important thing is to be approachable. Angela Hemans joins me for a 3-part interview on using social media to promote businesses in the healthcare space, including healthcare IT companies, as well as healthcare organizations. Angela is CEO of Hemans Marketing Media and founder of Women United In Business Mastermind Facebook Group. She helps healthcare, Tech, and Nonprofits build influence, make an impact, and increase leads leveraging social media and digital technology. Presented by lead generation marketing expert Jennifer Michelle. For more information, visit MichelleMarketingStrategies.com. Follow the #HCLeadGen hashtag for new interviews and tips! Learn how to use social media to create a community for your healthcare company. You'll discover ways to measure your ROI and why your social media needs to integrate with the rest of your marketing. Angela Hemans joins me for a 3-part interview on using social media to promote businesses in the healthcare space, including healthcare IT companies, as well as healthcare organizations. Angela is CEO of Hemans Marketing Media and founder of Women United In Business Mastermind Facebook Group. She helps healthcare, Tech, and Nonprofits build influence, make an impact, and increase leads leveraging social media and digital technology. Presented by lead generation marketing expert Jennifer Michelle. For more information, visit MichelleMarketingStrategies.com. Follow the #HCLeadGen hashtag for new interviews and tips! Marketing needs to be creative, yet frequently gets pulled off projects to put out fires. Find out how technology can help keep your marketing team on task. (Sponsored by L & R.) Larry Williams joins me to show what tools exist that can help your sales and marketing teams run smoothly. Larry is the Brand Ambassador for L&R, which focuses on employing the right technologies to allow marketing departments to invest their time strategically, instead of constantly managing one-off projects. In this 3-part podcast interview, Larry shows how technology can help teams protect brand integrity and work more strategically. Brand compliance gets tricky when your sales team goes rogue. Find out how to give your sales team the tools they need to stay on-brand. (Sponsored by L & R.) Larry Williams joins me to show what tools exist that can help your sales and marketing teams run smoothly. Larry is the Brand Ambassador for L&R, which focuses on employing the right technologies to allow marketing departments to invest their time strategically, instead of constantly managing one-off projects. In this 3-part podcast interview, Larry shows how technology can help teams protect brand integrity and work more strategically. Discover ways to help your sales and marketing team work together more productively. Learn how web-based libraries can store - and protect - your marketing collateral. (Sponsored by L & R.) Larry Williams joins me to show what tools exist that can help your sales and marketing teams run smoothly. Larry is the Brand Ambassador for L&R, which focuses on employing the right technologies to allow marketing departments to invest their time strategically, instead of constantly managing one-off projects. In this 3-part podcast interview, Larry shows how technology can help teams protect brand integrity and work more strategically. In this Quick Tip, I share two helpful hints to help your marketing team keep control of their to-do list. In this Quick Tip, I show you how to get the most out of your marketing team with two simple, non-tech tools. Discover how earned and paid media can work together – and what reporters really want to know. Interview with Lea Chatham, Director of Content Marketing at Solutionreach. See how thought leadership goes beyond content marketing – and how to choose the right person for the role. Interview with Lea Chatham, Director of Content Marketing at Solutionreach. Find out the key ingredient behind any successful PR campaign – and how to choose the best PR consultant. Interview with Lea Chatham, Director of Content Marketing at Solutionreach. Quick Tip #4: Is Your CEO Your Best Choice for Thought Leadership? Marnie Hayutin, Director of Hayutin Creative, gives tips to help you make sure your white papers and case studies are actually valuable - and not boring - to your audience. Marnie Hayutin, Director of Hayutin Creative, shares her experiences creating inbound campaigns that deliver on ROI. Marnie Hayutin, Director of Hayutin Creative, uses her journalism background to give insights into the best use of sponsored content. Learn how your healthcare business can increase click-through rates. This Quick Tip helps you find your thought leadership message - so you can start landing speaking opportunities and telling the world! Nirav Modi, President and Co-Founder of Carium, shares his thoughts with me on hiring for diversity in healthcare IT. In Part 3, we explore the issues of getting resumes from a diverse pool of candidates. Discover why Nirav believes a diverse team is instrumental to success. Nirav Modi, President and Co-Founder of Carium, shares his thoughts with me on challenges in healthcare IT. In Part 2, we talk about issues of scalability in a world where health systems all vary. See why Nirav feels positive about health systems and their ability to embrace technology. Nirav Modi, President and Co-Founder of Carium, shares his thoughts with me on the future of healthcare IT. In Part 1, Nirav tells why he thinks innovation from the telecom industry can be used to create a patient-centric approach to healthcare data. This Quick Tip helps you figure out what to talk to your audience about - so they'll actually want to work with you! Trying to build a stellar content strategy? This Quick Tip will make it easy! Shereese Maynard, healthcare strategist and founder of Envision Care, joins me for an in-depth look at lead gen in healthcare. In Part 3, we talk about the best way to use social media - and the treacherous allure of purchased lists. Shereese Maynard, healthcare strategist and founder of Envision Care, joins me for an in-depth look at lead gen in healthcare. In Part 2, we talk about using native ads and sponsorships - and how to get the most bang for your buck from healthcare conferences. Shereese Maynard, healthcare strategist and founder of Envision Care, joins me for an in-depth look at lead gen in healthcare. In Part 1, we dive into the world of White papers. Find out the #1 mistake we see vendors make with them.